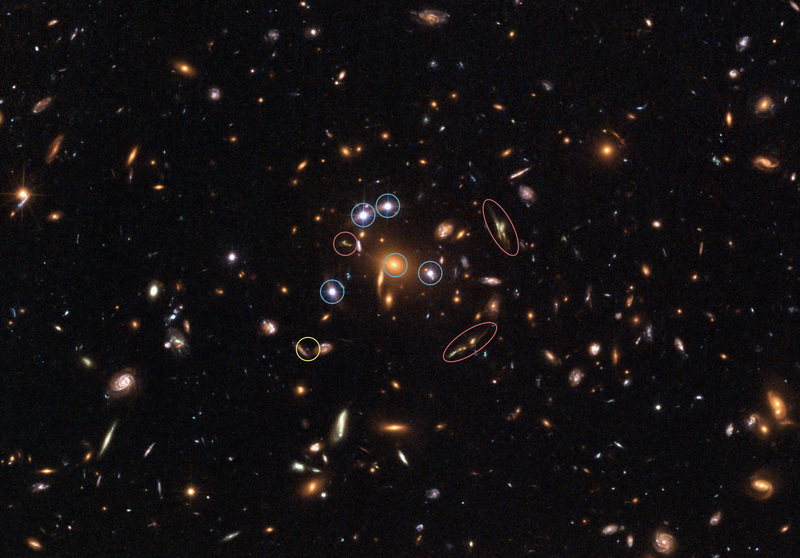 This full-size Hubble image shows galaxy cluster SDSS J1004+4112 with three rare phenomena marked. The blue circles show a unique five time gravitationally lensed quasar. This image is the first-ever picture of such an object. A gravitational lens will always produce an odd number of lensed images, but one image is usually very weak and embedded deep within the light of the lensing object itself. Hubble's sharp vision and the high magnification of this gravitational lens combine to place the fifth image far enough from the core of the central imaging galaxy to make it visible. The red circles mark three remarkably different images of the same background galaxy. The galaxy is 12 billion light years away (a redshift of 3.33, corresponding to only 1.8 billion years after the Big Bang). The yellow circle marks a supernova that was found by comparing this image to a picture of the cluster obtained with Hubble a year earlier. This supernova exploded seven billion years ago in one of the cluster galaxies. This image, together with other supernova observations, is being used to try to reconstruct how the Universe was enriched by heavy elements through these explosions.